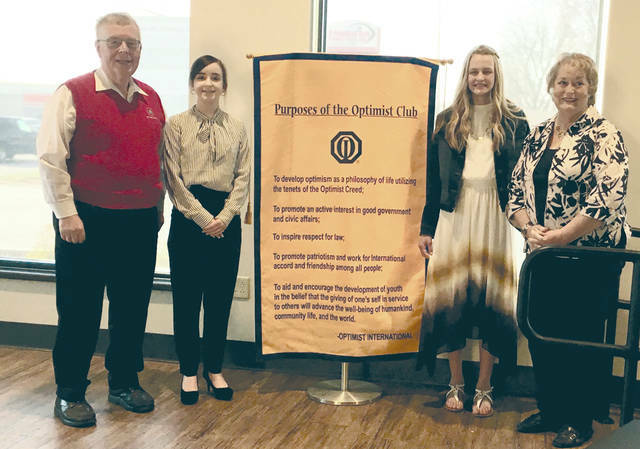 Provided photo Pictured from left to right, Steve Hamman of the Troy Noon Optimists, Olive Stringer, Savannah Swanson, and Pat Morris, Troy Noon Optimist chair of the Oratorical contest. TROY — The results of The Great Ohio District of Optimist International was held Saturday, April 6 at the University of Northwestern Ohio in Lima. The top two speakers were from the Troy Noon Optimist Club. First place speaker was Olive Stringer, and second place was Savannah Swanson. This is the second year in a row that the Troy club provided the first and second place speakers. Both Stringer and Swanson will move to the district contest in Dublin, Ohio, on April 27.
https://www.dailycall.com/wp-content/uploads/sites/30/2019/04/web1_Oratorical.jpgProvided photo Pictured from left to right, Steve Hamman of the Troy Noon Optimists, Olive Stringer, Savannah Swanson, and Pat Morris, Troy Noon Optimist chair of the Oratorical contest.